Welcome to a second week of Reader’s Request! This week’s question has come from more than one reader- and I’ll admit it’s a tough one. It almost stumped me! The question is: what to wear in Disneyworld? This is a great question because while you want to look cute, you must also keep in mind that you will be on your feet all day! No matter how comfortable you want to be, please- whatever you do- don’t wear the outfit on the right! This oversize t shirt is so unflattering, and the cropped yoga pants make my legs look really short! Don’t even get me started on the tennis shoes! However, you do want to wear something that is very comfortable. That being said- my suggestion is a short, loose, cotton dress. The fabric must be breathable (hence the cotton), and the length should be at the knee. I wouldn’t suggest a maxi dress because climbing in and out of rides could get tricky with a long dress. I like black because it won’t show dirt as easily- and the loose fit will allow me to eat all day long and not worry about a food baby! Remove the scarf as soon as you warm up. I love a dress because it can transition from day to night easily- (especially if you are going to Disneyland- it gets cold in CA at night!). A dress is so easy to layer- throw a scarf, a cardigan and a pair of leggings in your backpack- and when the sun goes down you can easily add whatever you need. By far, the most important part of your outfit is your shoes. You will be on your feet for probably 12 hours, so more than anything you need your feet to be extremely comfortable. Let me just share with you my new FAVORITE shoe! It’s a Dansko sandal and I am seriously in LOVE with this shoe! I wore it last week when I flew to California- I put them on at 4:30 am and wore them until 9:00 pm and my feet did not hurt at all. I swear! This is coming from someone who usually has horrible lower back pain, serious fatigue and aching feet and I honestly felt amazing. I never knew a shoe could make such a difference. Please take my advice and go buy yourself some. Wear them around the house a few days before you go- don’t ever wear brand new shoes to Disney (I’ve made this mistake and had to wear my clunky tennis shoes on the second day- and you know how I feel about that!). There you have it- please feel free to comment and let us know what you would wear to Disney! Use your scarf as a blanket when the sun goes down! Throw on a cardigan if you get chilly. It’s Fashion Friday– so be sure to click over to see more inspiration! May 25, 2012 by Megan2 Comments on May 25th, You Again? However, in reality- that’s not very realistic. Most of us only have a limited number of items in our closets, so of course we repeat outfits! The key is, to try make each outfit look original and different. This is done by choosing accessories and layering. For example, the dress I’m wearing today I’ve worn several times- as seen here and here and here. Today I’ve paired it with a bright orange cardigan, a colorful belt and off white wedges. When I originally saw this dress I didn’t like the way it fit at all- it’s too loose and unstructured. But- it was on clearance, and you know I love my stripes- so I decided to see if I could find a way to make it work. By simply adding a belt- I have given this dress the shape it needs. This may seem really obvious, but until recently I would have never added a belt if there weren’t any belt loops! Don’t let a simple thing like that stop you from creating the look you desire! For more cute fashion ideas, check out Fashion Friday! I love the way this colorful belt ties in the blue and orange! Today’s look is another extremely simple, yet stylish (in my opinion) outfit. I’ve simply paired skinny jeans with a plain white shirt. Nothing to it. Well, there’s something to it. I’ve said this before- but please don’t wear golf shirts- or polo style shirts- (unless of course you are golfing). They really aren’t stylish or fashionable at all. On the left is a much better version. I’ve got on this cute white button down shirt layered over a white tank and then added this cute necklace. It’s a super casual, super easy look that comes down to small details. This shirt’s details are in the side panels, the breast pockets and the 3/4 sleeves. A cool pair of sandals finish the look. 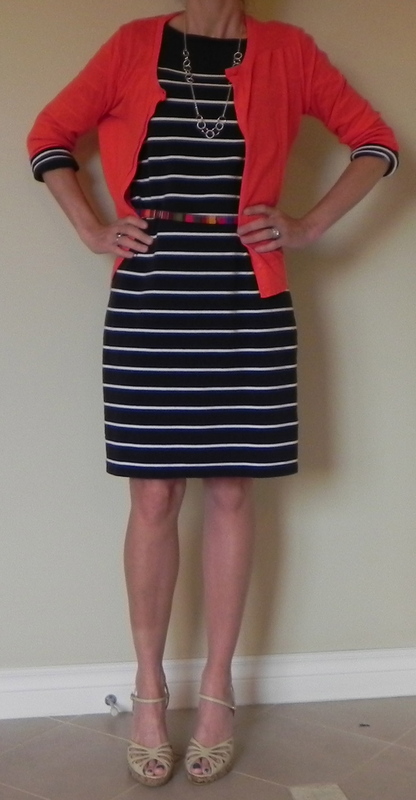 It’s Fashion Friday, so I’m linking up with Melissa over at Girlymama! Have a great weekend! *I realize this outfit is very similar to Wednesday’s outfit. I seem to be lacking creativity this week. I apologize! This shirt is made of very soft cotton and has stretchy panels in the sides- making it super comfy! Here is another option- a crisp white shirt. Let me tell you a little story about a mom who wandered into a consignment shop and found a cheap thrill! My son was getting his hair cut the other day- and lo and behold right next door was a consignment shop, so of course I had to go in and explore. Let me tell you- it was SO MUCH FUN! I’ve always been a fan of bargains- and love finding something on sale, but I never imagined the thrill I would get in a re-sale shop! Yes, it smelled a little funny in there. Yes, there were a lot of awful clothes. Yes, I felt a little weird looking at other people’s discards. But- there were also some great finds and great prices- including this fun little vest I’m wearing today. Now, here’s the weird part. Just the other day I was at an intersection and saw a cute gal walking by. She had on workout pants, a t shirt and the coolest vest. I wondered where she got it- I thought it was so unique and so interesting. I walked into the consignment shop and the first thing I find- I swear- is this vest. It is almost the exact same vest as the one I saw! It was fate! And it was only $12!! I brought it home, washed it in hot water (twice) and now here it is, complimenting a white V neck shirt and paired with red jeans. It adds so much interest to what otherwise would have been a boring outfit (as seen on the right). The morale of the story is- if you are wanting to re-fresh your wardrobe, and don’t want to spend a fortune- consider checking out your local consignment store. You may be surprised by what you find. A piece of advice, go with an idea in mind of what you are looking for- and it’s ok to leave empty handed. The thrill is in the hunt! And for a good laugh, check out this post on jeans I found at the Goodwill! It shows some really bad Mom jeans! This vest was meant to be mine! These pockets are perfectly placed! Don’t forget to check out Fashion Friday over at Girlymama! I’m being profiled on Mommypage.com today- so if you want to see my face, here is your chance! LOL! Click here! This outfit is so simple that I almost feel silly showing it! I’m telling you right now, if you are looking for cutting edge fashion you’ve come to the wrong place. 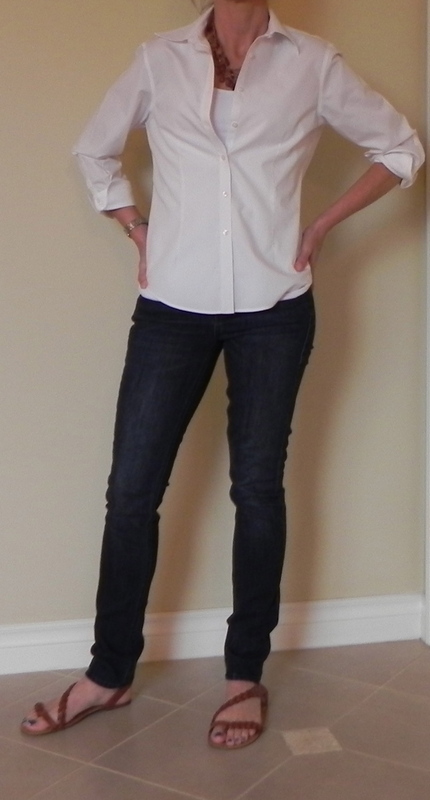 If you want simple mom outfits- welcome to my blog! That being said, I really love this look- just khaki and black! It’s classic, easy and cute! I bought this skirt a long time ago- and have worn it several times- I love that it’s been a such a versatile piece for me. On the right I’ve paired it with a black turtleneck. There isn’t anything wrong with this look- but it might be a little too covered up. It’s too safe (and wintery). On the left I have replaced the turtleneck for a v neck sweater. By showing a little more skin, it looks better. To complete the look, I’ve added a long pendant necklace. This is a good trick to draw the eye up and down (making me look thinner!). pss. thanks for all the votes for Top Mommy Blogs! You all are awesome! psss. it’s Fashion Friday, so of course I’ve linked up with my pals at Girlymama… check them out!